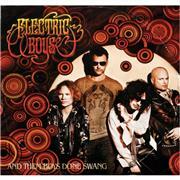 ELECTRIC BOYS started as a duo of Conny Bloom, guitars/vocals, and Andy Christell, bass. They scored a direct hit with “All Lips N´ Hips”, and immediately recruited Franco Santunione on guitar and drummer Niclas Sigevall. The mix of grooves, BEATLES- psychedelica and heavy guitar riffs helped them get their debut “Funk-O-Metal Carpet Ride” out in 1989. A later rerelease featured five additional tracks produced by Bob Rock. Touring in Europe and the US ensued, and MTV played them frequently. Next up was the hit single “För Fet För Ett F’’k” written especially for the late comedian Micke Dubois. But they didn´t see it suitable to rest, but continued with the next album “Groovus Maximus”, which was followed by a lot of touring too. The saga first ended in 1994 not long after the release of third album “Freewheelin´ “. Conny and Andy played with HANOI ROCKS between 2006-08 and decided to reunite ELECTRIC BOYS during that time. A “Best of” was conceived and they played the Sweden Rock Festival, plus supported ALICE COOPER in December. The original line-up is in place, are they truly back in action? Ok, this is not the nineties. I remember the band´s heyday very well, and it was not quite the setting of 2011. There is no surprise in using the seventies and psychedelica, and the Trax list that first made them famous has been shelved. The fun parts seem less funny these days, and there is no Micke Dubois to help out. But there are some truly outstanding moments on offer; “Reeferlord” is straightforward enough to become something, the same goes for the rather straightforward “Angel in an Armored Suit” and the maximum groovy “A Mother of a Love Story”. The cozy ballad “Ten Thousand Times Goodbye” fares well, as does the seventies tinged “My Heart´s Not for Sale”. But there are too many ok songs on here to make for a standout album in the vein of their early albums. The chosen single or video track is the BEATLES-oozing and spaced out track “Father Popcorn´s Magic Oysters”, but they are not SOUNDGARDEN. I wonder what they´d smoked prior to writing “Sometimes U Gotta Go Look for the Car”, with its oddball lyrics. Naah, as much as I frolic at their return, I must regret that the times…they are a-changin´.